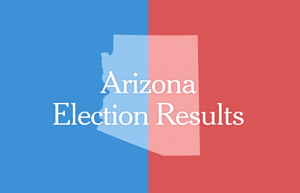 Democrats received critical affirmation of their momentum yesterday in the special election in Arizona 8th Congressional District, despite the fact that the Republican won. 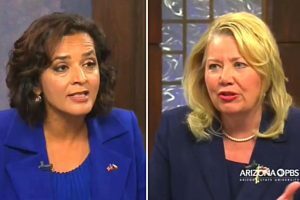 In a district that President Donald Trump won by 21 points in 2016, Republican State Senator Debbie Lesko defeated Democrat opponent and former emergency-room physician Hiral Tipirneni 52.6% to 47.4% -- a mere 5% margin. The House special election, one of twelve this election cycle, was to fill the seat vacated by incumbent Republican Trent Franks who resigned December 5, 2017, following sexual misconduct allegations. The 60 year-old Franks, a millionaire and former oil man, was first elected in 2002 in what was then the 2nd congressional district. Following the 2010 census, Franks was redistricted to the new 8th CD, where he won re-election in 2012 with 63% of the vote, and in 2014 (74%) and 2016 (71%) before resigning in his eighth term. The 8th District covers the suburbs north and west of Phoenix, in Maricopa County, Arizona. It includes the West Valley portion of the Valley of the Sun and includes Glendale, Surprise, S un City, Peoria and part of western Phoenix. The predominantly white, senior population, where Republicans outnumber Democrats in registration by 78,000 voters, has been considered a strong GOP seat. But like many other once-reliably red districts, voters of the 8th appeared to sway toward the blue wave that is widely expected to sweep Congress in November. Despite Tuesday's loss, Democrat Hiral Tipirneni carried 58 of the district's 142 precincts, compared to just 12 precincts carried by Hillary Clinton in 2016. This is encouraging for a likely rematch between Tipirneni and Lesko this November, when the seat, along with the other 434 House races, are up for their usual biennial re-election. Lesko's narrow victory also bodes well for other state Democrats in November, when they are battling for control of the Republican-held legislature, and the Republican Governor is up for re-election. On a national scale, Lesko's single-digit victory follows the pattern of other special elections during the 115th Congress, where Republicans have held onto most of their seats, but their voter performance advantage has shrunk considerably. Democrats have been further buoyed by their victory last month in the Pennsylvania's 18th special election, a seat Trump won by 20% in 2016, as well as the December 12, 2017 Alabama US Senate special election, where Democrat Doug Jones beat embattled Republican Roy Moore 50% to 48% in a state in which Trump beat Clinton with 63% of the vote. Democrats will need a net gain of 24 seats to reach the 218 of 435 needed to take control of the House in 2018. Ohio's 12 (August 7, 2018) and Michigan 13 (November 6, 2018, concurrent with normal general election). The election for New York's 25th CD to replace the late Louise Slaughter (D) has yet to be determined.